One of the range visitors today was a new shooter. 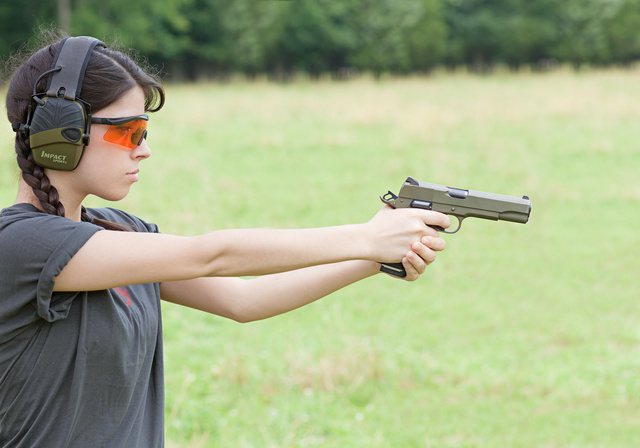 Alex started with S&W617 with CB caps, then shot suppressed Walther P22, Ruger 22/45, STI Elektra 9mm, suppressed Glock 17, Colt (her favorite) and Para Ordnance .45s, Coonan .357. 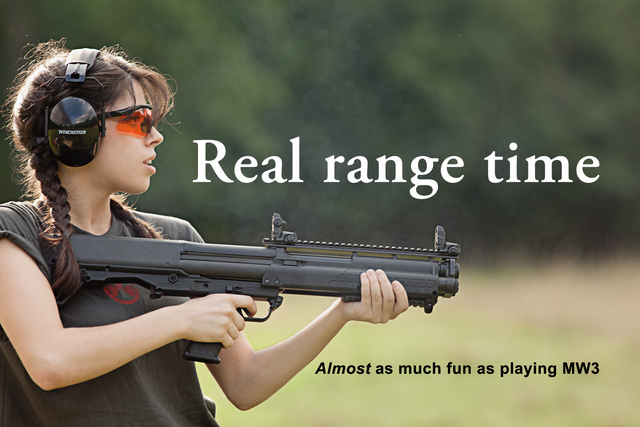 Then she shot extensively with suppressed Keltec SU22 and Ruger 10-22, 5.56mm and 6.8mm AR15s and Keltec KSG. Starting at the range of 5ft and ending at 25 yards, Alex achieved excellent accuracy with handguns and rifles, and showed good safety habits. And she had fun. This entry was posted in pistol, rifle, rkba, self-defense, shotgun, sound suppressor, training, weapon and tagged 12ga, 45ACO, cute, girl, keltec, KSG, M1911. Bookmark the permalink. 1911’s are every girls favorite. I have taught several females to shoot. And they all like 1911’s the best at the range. Full-sized ones that is. The sub compact ones are a little much for some of them. My ex took one of my full size ones with her when she went. And one of the CZ-75s. I miss those guns. Her, not so much. My wife(4’11”) carries concealed a full sized 1911. Pingback: (NSFW) Girls and Guns (contains provocative pictures) - Page 1188 - XDTalk Forums - Your XD/XD(m) Information Source! love the 1911 and the ksg. While that may be true in general, my impression is that in practice Oleg does not talk on his blog about those shooters who do not practice good safety, do not learn, and do not enjoy themselves. They are simply not invited back and you do not hear about them. Why would you want to hear about new shooters who don’t make the grade? Pretty much everyone does well. I am somewhat selective about the invitations…and those who have less aptitude just require more coaching on the basics. She had just come out of recoil at the time. Exactly — this is a middle photo of a three shot sequence. This is her second shot ever with 12ga. She was letting out the trigger slowly, having used to re-setting triggers on semi-autos. 100 years later the 1911 still sits at the top of the list. I wish I could invent something that good. Over the years I have taught Basic Pistol to 1000’s. While not all were new shooters, many were. If handled correctly almost every one of them came away feeling better about firearms and felt good about what they accomplished at the range. Our long term average is about 1/3 female. Ages from under 11 to over 80. We have had Very few exceptions. Getting some to shoot acceptably is sometimes a challenge and there have been times that I thought that we would fail. Almost always we figured out what the problem was and helped them shoot reasonably well.